You never know what’s going to happen when you’re out hiking on the trail. That’s why the best cameras for hiking are an important part of the experience. You can capture once in a lifetime memories without having to stop to get out your big, heavy camera. That’s why we researched some of the best products to put together these cameras for hiking reviews for you. Before we get started, let’s take a look at some of the important features you need to know. WiFi: Some of our picks are equipped with WiFi. You don’t really need WiFi in order to get awesome photos and video, but it does make it really easy to transfer the files to your phone or computer for editing. Resolution: Resolution measures how clear the picture is. 1080p is considered high definition while 4K is considered ultra-high definition. 720p is also considered full HD as well. The resolution of our top picks ranges from 720 to 4K. Waterproof: It’s a good idea to have a waterproof camera if you’re going to use for hiking. You never know what the weather will be. 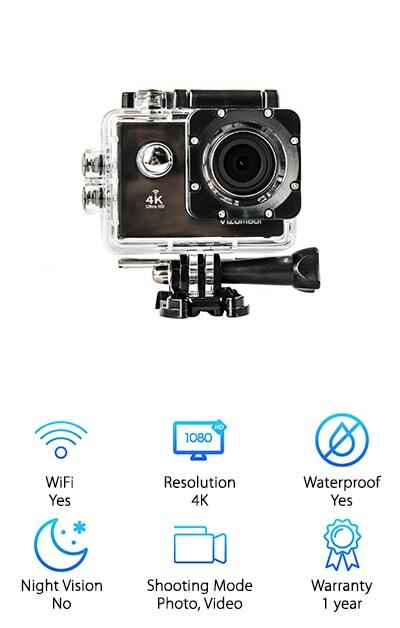 Some of these cameras can also go underwater if you go swimming during your adventure. Night Vision: Some cameras in this sporty style do have night vision features, but we didn’t include any in our reviews. We think hiking is more of a daytime activity so we looked for awesome daylight cameras. Shooting Mode: All of our picks are capable of shooting video and taking pictures. This makes things really convenient because you won’t have to worry about having multiple devices with you. See something worth recording? You’re already ready. Warranty: Warranties are always important, but especially with an electronic item like this. These cameras are going to be exposed to the elements: cold water, rain, heat, snow, wind. Make sure you understand your warranty, what’s covered and what isn’t. Now that you know more about the key features, let’s take a look at our reviews. If you’re looking for the best mirrorless camera for hiking or something a little simpler, you’re in the right place. Here’s the deal: we put our top pick and budget pick first. That’s a great place to start but stick around if you can because the rest of the items rounding out our list are pretty awesome, too. All right, let’s get right to it! GoPro makes the top of our list because we think this HERO6 is the best video camera for hiking. The thing that we loved the most about it was how easy it was to use. Get this: it automatically sends recorded footage to your cell phone. From there, use an app to turn it into an edited video. Don’t worry, you can send photos to your phone, too. Plus, the image quality is fantastic, in part because of how stable this camera is. And it doesn’t even matter if you’re holding it or have it mounted, it just captures really smooth footage. Another great thing about this camera is that it’s waterproof up to 33 feet. No need to worry about a little rain and you can even take it in the lake with you. 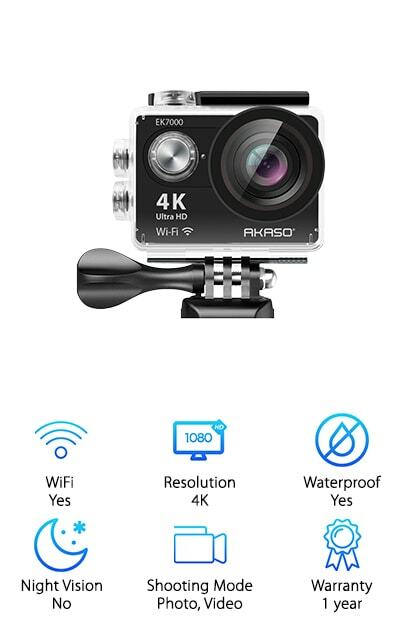 If you’re looking for the best camera to take hiking for the money, AKASO has a great one with their Sports Action Camera. Believe it or not, this camera has 4K Ultra HD technology. What exactly does that mean? It takes video and photos at 4 times the resolution of a traditional HD camera. Now, that’s a clear image! One thing that really stood out about this one is the remote control. You wear it on your wrist and it allows you to aim the camera, frame shots, or start recording at the touch of a button. The battery lasts up to 90 minutes of recording. Plus, with the built-in wifi and HDMI hook up, it’s really easy to share your photos with friends and family. One more thing: it comes loaded with accessories. We loved the GoPro HERO Session camera and are calling it our best camera for hunting videos. Why? Because it was designed to withstand extreme environments. So, no matter how hot, cold, wet, or dry it is outside when you’re hunting, this camera will be able to keep up. Plus, it has an easy 1-button control so you don’t have to mess with a lot of setting. Just turn it on and it’s recording. That’s it. When you’re done, push the button again and it stops recording and turns off. It’s WiFi and Bluetooth enabled, too, so it’s easy to share to your smartphone and with friends. Here’s the best part: it comes with a lot of accessories, too, like including several mounts so you’ll be ready to record right out of the box. 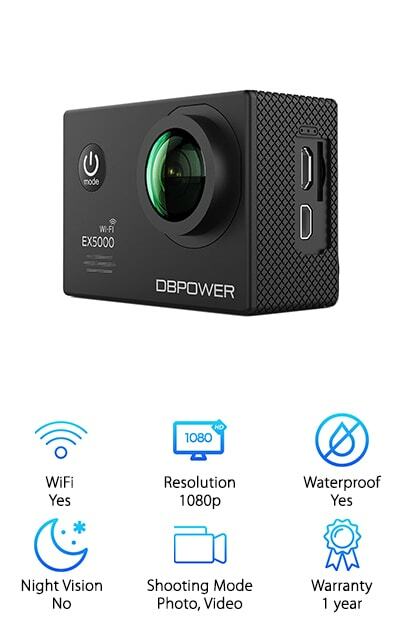 Another good camera for hiking is the DBPOWER EX5000 Action Camera. 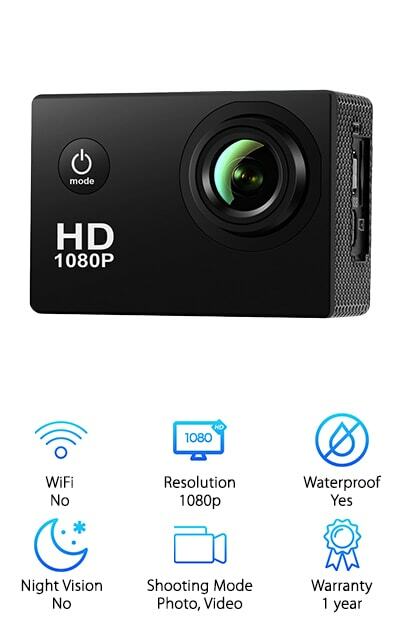 This is a full HD camera that records really clear video with a lot of detail. We really liked that it has a 2-inch LCD display that lets you immediately playback the video you captured or take a look at the photos you shot. Plus, it helps you frame your shot more effectively. The 170-degree wide-angle lens is really awesome, too. You can get really great photos and recording of the beautiful landscape as you hike along. There’s a smartphone app that lets you easily transfer your videos and pictures through the camera’s WiFi then start to edit and share your images. This camera can even head out into the lake with you because it’s waterproof up to 98 feet! This FITFORT Action Camera comes loaded with just about everything you need. If you’re worried about hiking with camera gear, don’t! It all comes nicely packed in a small case. The super wide-angle lens is able to record skip-free videos and takes amazing pictures. We were impressed with the remote control. Strap it on your wrist and at the push of a button, your camera is working. This is really convenient if you have the camera mounted to your helmet or somewhere else where you might be able to get to it easily. This camera is WiFi enabled and has an app that you can download right to your phone. Use it to control the camera or save, share, or manage your files. It’s waterproof to 100 feet so not even water will stop you. 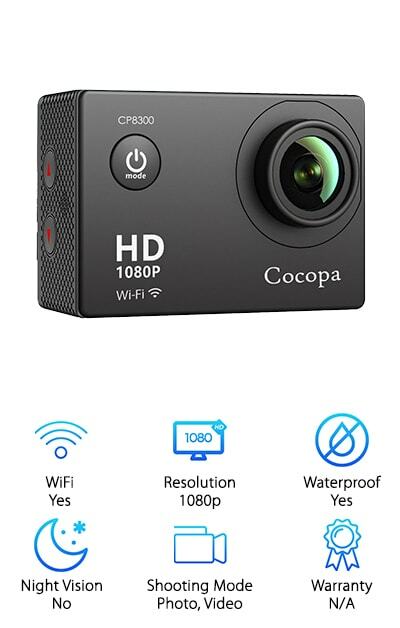 Cocopa has another option for best camera for hunting with this action camera. Even though it’s pocket-sized, it still gives you amazing HD images and videos and has a 170-degree wide-angle lens. Plus, thanks to the built-in WiFi, editing and sharing videos is super simple. Just get the free app on your smartphone or tablet and connect it to your camera! The 2-inch screen lets you see playback and review your photos. We really liked this idea because if you find out your shot wasn’t great, you’ll know to take another one before you leave. There are even multiple shooting modes to play with, including looping, burst, and time-lapse. Plus. the water-resistant case lets you dive as far as 98 feet below the surface and still get amazing shots. 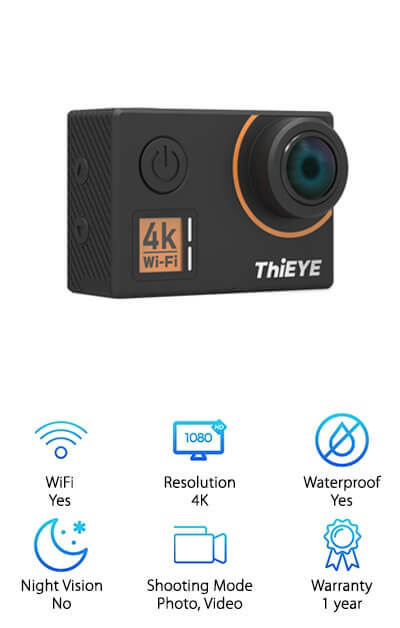 The ThiEYE T5 Edge Action Camera has a lot to offer and is one of the best cameras for the money. 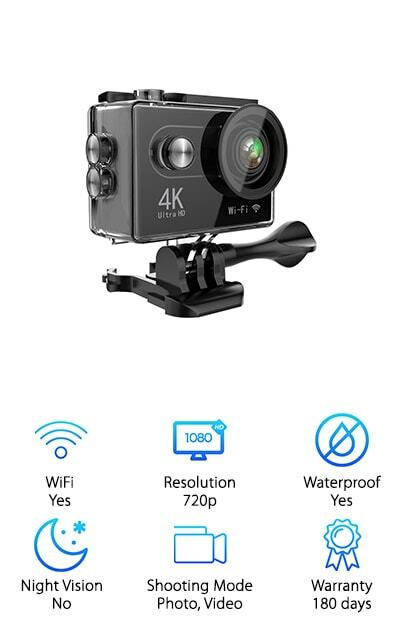 Get this: It records 4K 30fps, 2.7K 30fps, 1080P 60/ 30fps, 720P 120/ 60/ 30fps video and 20MP photos using a 170° super wide-angle 7G lens, which makes this sport camera the perfect partner to capture super smooth footage for you. Advanced gyro stabilization function (EIS) supports 4K gyro anti shake, minimizing blur to provide clear and stable images. Distortion collection function eliminates the distortion to get more natural shooting effect. That’s not all. The new T5 Edge is designed to withstand extreme environments, together with durable 197 feet waterproof case. Multifunctional and unique designed 360° rotating buckle enables you to mount your camera to helmet, bicycles, wrist, etc. There are a lot of good things about the VIZOMAOI 4K Sports Action Camera but the one that stood out the most to us was how long the recording time is. Most of the products we researched could go for about 90 minutes. This one lasts 110. This might seem like a small difference but think about it. That’s 20 minutes more you get when you’re out in the woods. You never know what’s going to happen. Now you have more time to capture it. The free app can be used on a smartphone or tablet and acts as a remote control and viewfinder. Use the WiFi connection or connect them directly with a USB cable. 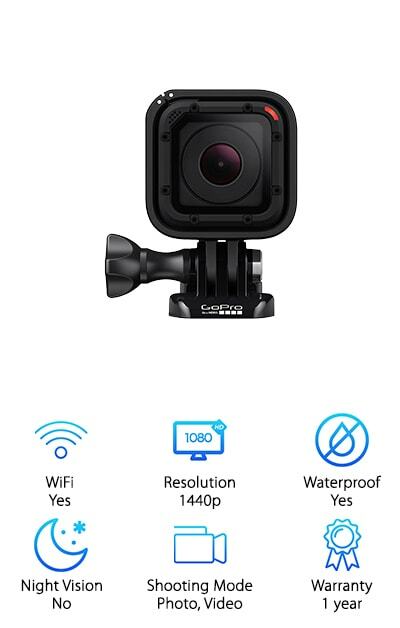 It comes with a lot of accessories, too, like a waterproof case, rechargeable batteries, and various mounts and supplies. The Amuoc Action Camera has a 2-inch HD screen that is great for watching video playback and reviewing your photos. 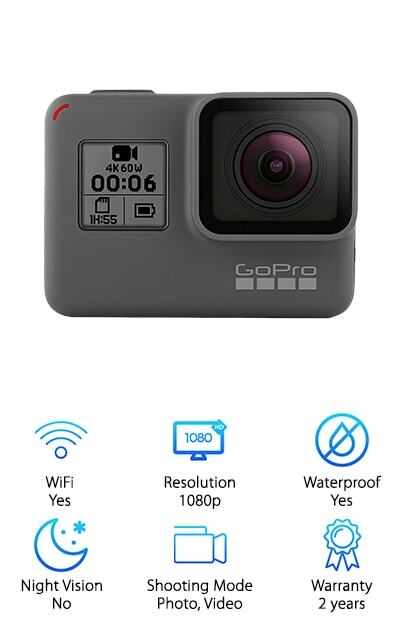 It has a built-in waterproof case that keeps your camera safe up to 98 feet so you can take it with you if you need to cool off in the lake during your adventures. You’re going to love the number of accessories you get with this camera. It includes a lot of mounts so you can mount it at your campsite or attach it to your pack. Get this: you can even choose from multiple shooting modes. Set it to the motion sensor or even do a loop recording. Plus, you can make adjustments to the exposure, sharpness, and balance to get your images just the way you want them. 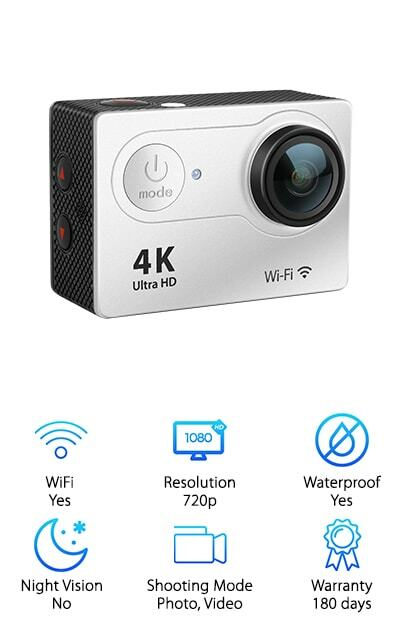 Hiearcool’s 4K Action Camera has a high-quality image sensor that can capture 4K video. But here the kicker. It also has a wireless remote control that lets you control the camera, frame shots, and record video. And it’s so easy, just strap the remote on your wrist and just press the button to use the remote control. Don’t worry about stopping what you’re doing to get the perfect shot! This one has built-in WiFi and an HDMI cable for easy file transfer. Download the free app and you can easily edit and share your photos and videos. There are a lot of accessories included with this camera, too. 18 in total. Plus, it’s equipped with a durable waterproof case that can also stand up to drops, dust, and freezing cold temperatures.